MidwayUSA has Bore-Store synthetic fleece rifle storage bags on sale. 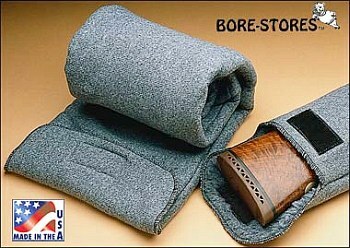 We can say, unequivocally, that Bore-Stores are a great product. Every gun in this editor’s safe rests in a Bore-Store. Bore-Stores cushion your guns against dings and scratches while the breathable fabric wicks away moisture and fights rust with a special anti-corrosion coating. The fabric is coated with pure silicon and an extra rust-inhibiting chemical. Bore-Stores are relatively inexpensive and last forever. Unlike cotton, wool, leather or canvas bags, the fibers do not absorb and retain moisture. You really can’t beat them for storage in a safe because they cushion the gun as well as fight rust and aluminum corrosion. MidwayUSA has the full line of Bore-Store cases on sale. We’ve found that the latest examples run on the roomy side, so the 46″ scoped rifle case, item SRC-1, will fit guns up to 48″ overall, with plenty of clearance for a big scope. The 46″ case is now $9.99 marked down from $11.49. The 40″ Scoped Rifle Case, item SRC-3 ($9.49 on sale), will fit most short-range BR guns up to 42″ in length. There are also models for shotguns, carbines, and pistols. Share the post "Bore-Store Protective Bags on Sale"
Interested in a Bore Stores SRC-3, price quoted @ $9.49.